Abstract. The Regional Antarctic ice and Global Ocean (RAnGO) model has been developed to study the interaction between the world ocean and the Antarctic ice sheet. The coupled model is based on a global implementation of the Finite Element Sea-ice Ocean Model (FESOM) with a mesh refinement in the Southern Ocean, particularly in its marginal seas and in the sub-ice-shelf cavities. The cryosphere is represented by a regional setup of the ice flow model RIMBAY comprising the Filchner–Ronne Ice Shelf and the grounded ice in its catchment area up to the ice divides. At the base of the RIMBAY ice shelf, melt rates from FESOM's ice-shelf component are supplied. RIMBAY returns ice thickness and the position of the grounding line. The ocean model uses a pre-computed mesh to allow for an easy adjustment of the model domain to a varying cavity geometry. RAnGO simulations with a 20th-century climate forcing yield realistic basal melt rates and a quasi-stable grounding line position close to the presently observed state. In a centennial-scale warm-water-inflow scenario, the model suggests a substantial thinning of the ice shelf and a local retreat of the grounding line. The potentially negative feedback from ice-shelf thinning through a rising in situ freezing temperature is more than outweighed by the increasing water column thickness in the deepest parts of the cavity. 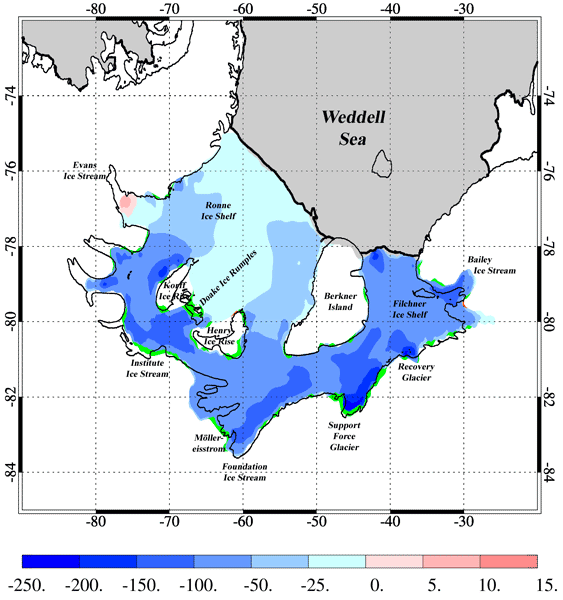 Compared to a control simulation with fixed ice-shelf geometry, the coupled model thus yields a slightly stronger increase in ice-shelf basal melt rates. 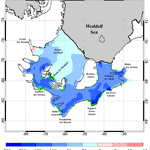 How to cite: Timmermann, R. and Goeller, S.: Response to Filchner–Ronne Ice Shelf cavity warming in a coupled ocean–ice sheet model – Part 1: The ocean perspective, Ocean Sci., 13, 765-776, https://doi.org/10.5194/os-13-765-2017, 2017.